The U.S. Capitol Building is a monument, office building, and internationally recognized symbolism of democracy. 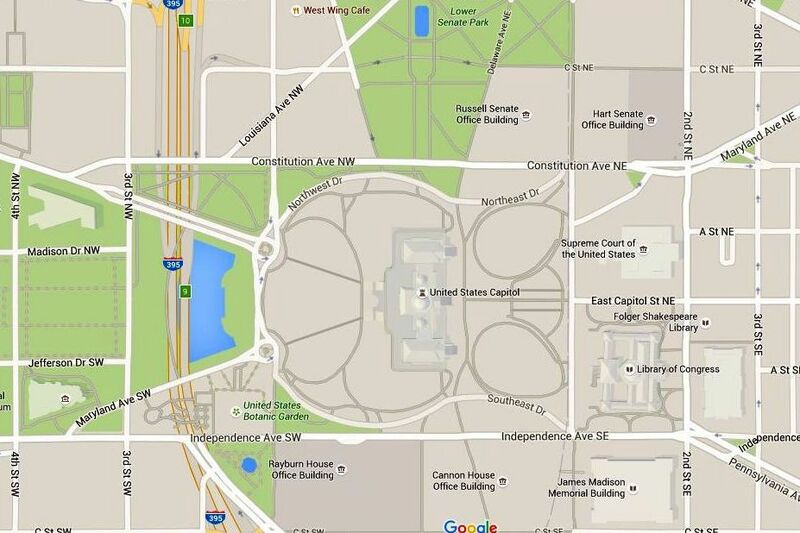 This map shows the location of the Capitol Building, the Capitol Visitor Center, and the West Lawn in Washington, D.C. The Capitol is on the east end of the National Mall at East Capitol Street NE and First Street SE. The Senate office buildings are on the north side, and the House office buildings are on the south side the building. The Capitol grounds are open to visitors. Free annual concerts are held on the West Lawn (nearest access is Northwest Drive) on Memorial Day, the Fourth of July, and Labor Day. The main entrance to the visitor center is underground on the east side of the building. The visitor center is open 8:30 a.m. to 4:30 p.m. Monday through Saturday except on Thanksgiving, Christmas, New Year's Day and Inauguration Day. The Capitol is bordered by Constitution Avenue NE to the north, Independence Avenue SE to the south, and First Streets to the east and west. By car: From the George Washington Memorial Parkway, take I-395 North to C Street NW. Take Exit 9 to First Street NW. From the Baltimore Washington Parkway, take State Highway 295 to I-695 to C Street NW to Exit 9 to First Street NW. Parking is limited near the U.S. Capitol Building. The best place to park is at Union Station on 50 Massachusetts Ave. NE. There are more than 2,000 public parking spaces. For more options, see this guide for parking near the National Mall. The Capitol Visitor Center offers free shuttle service for those with mobility issues. The shuttles run from the southwest corner of Capitol Square at Independence Avenue and First Street SW to the visitor center entrance at the center of the Capitol’s East Plaza. To arrange for a shuttle, call 202-224-4048. By Metro: The closest Metro stations are Union Station, Capitol South, and Federal Center SW. See a guide to using the Washington Metrorail. By bus: The DC Circulator Bus includes stops near the U.S. Capitol Building. Take the Union Station-Navy Yard route and get off at Independence Avenue SE. By bicycle: Capital Bikeshare offers short-term bike rentals at hundreds of stations throughout the Washington, D.C., area. You can join for a day, three days, a month, or a year. Take a bike from any station and return it to the station of your choice. The closest kiosk to the Capitol is at 400 East Capitol St. NE. This map shows the U.S. Capitol Building and the surrounding area including the locations of the closest Metro stations: Capitol South, Federal Center SW, and Union Station (northeast of the Capitol off Massachusettes Avenue NE). Many of Washington, D.C.'s most popular attractions are within walking distance. To the west is the National Mall, the Smithsonian Museums, and the National Memorials. To the east are the Supreme Court and the Library of Congress. Capitol Hill is an interesting neighborhood to explore and has many great restaurants, parks, and other attractions. Read more about Capitol Hill.